The ELTA website and its digitised theatre collections are currently not available. The University of East London is actively pursuing options for making these available again in the near future. In the meantime, if you have any questions please email library@uel.ac.uk. We apologise for any inconvenience this may cause. 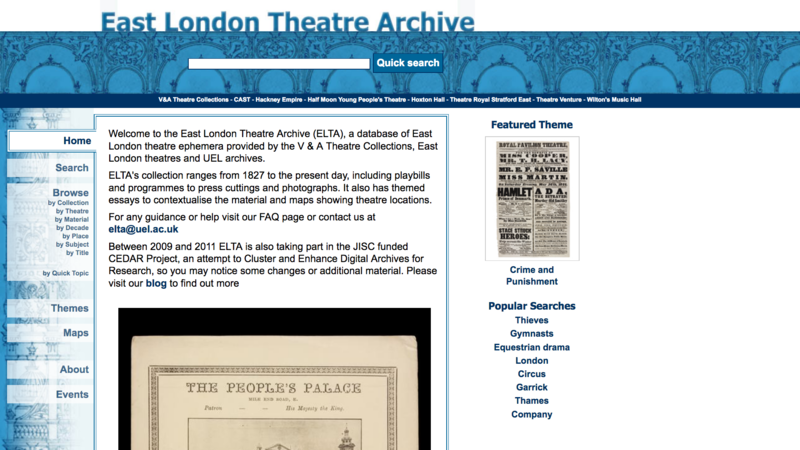 The East London Theatre Archive (ELTA), is a database of East London theatre ephemera provided by the V & A Theatre Collections, East London theatres and UEL archives. ELTA's collection ranges from 1827 to the present day, including playbills and programmes to press cuttings and photographs. It also has themed essays to contextualise the material and maps showing theatre locations. Between 2009 and 2011 ELTA is also took part in the JISC funded CEDAR Project, an attempt to Cluster and Enhance Digital Archives for Research, so you may notice some changes or additional material.